The May 25, 2012 article from Chutian Metropolis Daily that started it all. I Went to China to Find My Birth Mother. Instead, I Became the Focus of a Nation’s Buried Pain. By Jenna Cook, who graduated from Yale University with a degree in Women’s, Gender, and Sexuality Studies in 2014; from 2014-2015 she was a China Fulbright Scholar. This article was first published by Foreign Policy’s China channel, Tea Leaf Nation. “I dressed you in the new clothes for good luck. I kept this scrap for 20 years to remember you. My little baby, you must have seen this cloth before! You must have the matching clothes?” No, I shook my head. I had never seen it. Her face fell and she began to sob. I felt I owed it to my birth family to try to locate them; but most of all, I owed it to myself. This was the summer of 2012, in the oppressively humid, industrial city of Wuhan, China. I grew up in Massachusetts and had returned to Wuhan with my adoptive mother in search of my birth parents. I felt I owed it to my birth family to try to locate them; but most of all, I owed it to myself. I never expected that the search would attract an outpouring of media attention; bring forward dozens of families, all claiming that I was their lost daughter; and uncover a nationwide pain, forged over decades, with which the country is still reckoning. I was 20 years old then, a rising junior at Yale, and had returned on a grant from my university’s fellowship office. My proposal stated that I would “document the process of searching so that it could serve as a useful guide for the other 80,000-plus Chinese international adoptees living in the U.S.” I had planned to visit three Chinese government offices to look for my adoption records and then hand out missing-person fliers (pictured above) on Wuhan’s busy sidewalks. I wanted to search because I felt that going through the process—regardless of the result—would be a release. As planned, shortly after arriving in China, my adoptive mother and I visited government offices and handed out fliers. It all changed about a week into our trip, when a friend of a friend of another friend who worked as a journalist at a local newspaper, the Chutian Metropolis Daily, offered to write a short article about the search. The first article appeared on May 25, 2012, on page 5. The headline: “Dad, mom: I really hope that I can give you a hug. Thank you for bringing me into this world.” Within weeks, the story of my search had gone viral. There were print articles in major Chinese outlets like Southern Weekly, Southern Metropolis Daily, and Beijing Youth Daily. State broadcaster CCTV made short documentary films for its programs, including Nightline, Insight, and Waiting for Me. Regional television programs from Hubei, Hunan, and Chongqing covered it, as did video sites like Tudou and Internet portals like Tencent QQ. My following on the microblog platform Weibo quickly reached hundreds of thousands. Telephones at the Chutian Metropolis Daily rang nonstop. Then there were the emails I received from Chinese people in every province, including the western regions of Xinjiang and Tibet, as well as overseas Chinese living in Canada, Australia, the Philippines, Germany, and the U.K. Some wrote to wish me good luck or to encourage me to “never give up,” while others wrote that I should be thankful to my American mother and stop wasting my time. Some messages hinted at the deep pain surrounding the relinquishment of children. A college student wrote to tell me about finding an abandoned infant on a street, but his parents wouldn’t let him take her home. A woman in her 30s wrote that she remembered her parents abandoning a sister in the 1990s but was afraid to ask them about it. One person composed a song called “Dandelion in the Wind” and sent me an MP3 recording, lyrics, and sheet music. The Chinese press sensationalized my story to attract readers. 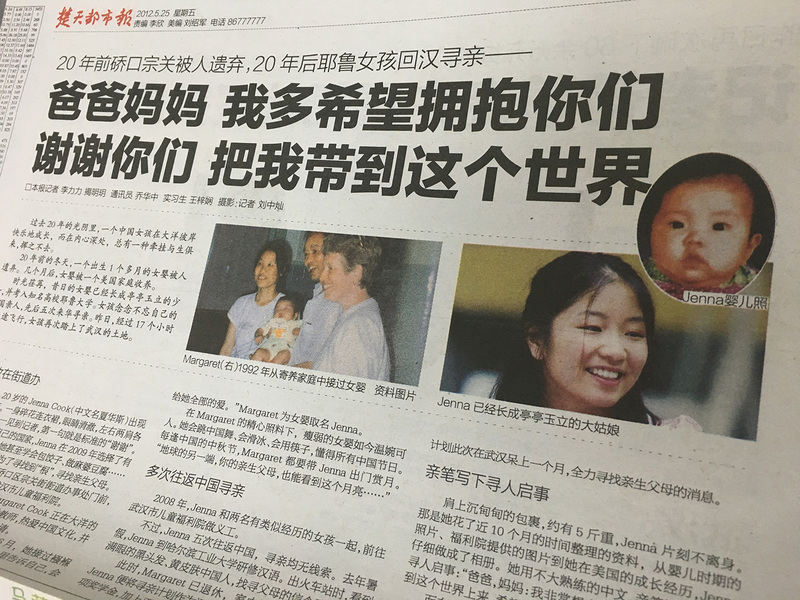 I was quickly labeled an “abandoned female infant” who “went to a developed country” and “became a Yale student.” One Chinese reporter marveled in passing, “How is it that you could go from being so unlucky to so lucky? In one moment your fate changed.” This fixation with “luck” and Ivy League schools obscured the fact that Chinese adoptees, as a population, are also quite unlucky. Although we gained new families, we lost our original culture, language, and citizenship rights. Many of us confronted racism in home communities where there were few other people of color. Every year there are cases of suicide that shake our community. Jenna Cook revisits the orphanage where she had lived in 1992. I believe my story resonated with the Chinese public because so many have relinquished children. During my search, I met with over 50 birth families—each of which had left a baby on one single street in Wuhan in March 1992. The implications of this are quite vast. What about other streets in the same month? What about other months? What about other years? What about the families who chose not to come forward? From 1992 to 2013, according to one estimate, 139,696 Chinese children were sent abroad for international adoption. They have done so for varied and tangled reasons, from the one-child policy to the desire to have a son; from poverty to teen pregnancy; or from a child’s or family member’s disability. Although it is impossible to pin down the number of relinquished children, it is safe to assume that it is considerable. 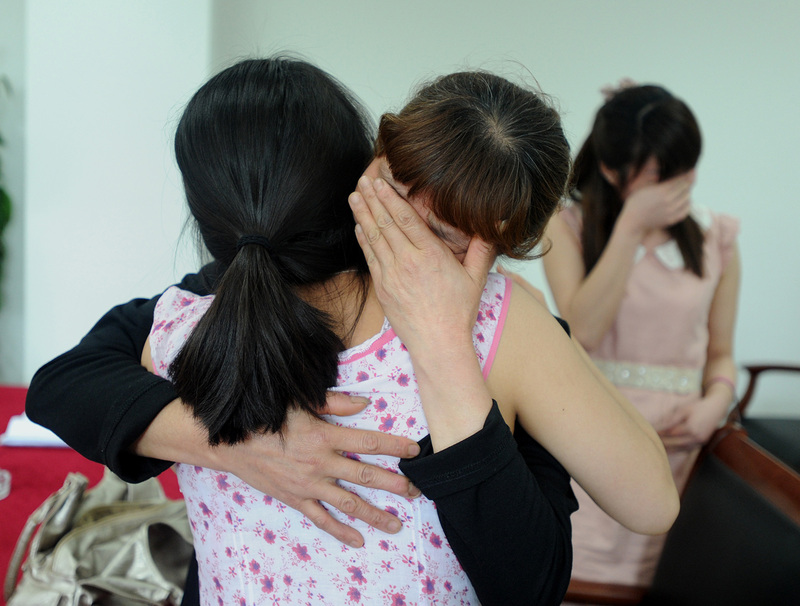 From 1992 to 2013, according to one estimate, 139,696 Chinese children were sent abroad for international adoption. The Chinese government reports 494,616 total registered domestic adoptions within China from 2000 to 2013 alone, excluding informal domestic adoptions. In 2012, when I visited a long-distance bus station close to the street where I had been abandoned, I asked one of the older workers if she remembered finding a baby nearby in March 1992. She sighed and recalled that, “back in the day,” she and her coworkers found abandoned babies in the station all the time. A retired policeman from the nearby police station agreed, saying abandonment was so common in that era that authorities would not even bother recording them. Jenna Cook with her adoptive mother. Chinese people often assumed that by searching for my first family, I was hurting my American mom. I now understand why my adoptive mother’s decision to join my 2012 search shocked the Chinese public. During my follow-up research, many mainland adoptive parents confided that they felt it was best if their children never found out they had been adopted. Chinese adult domestic adoptees who had discovered their adoptions and had reunited with their birth families often described being pulled between their two families in a competition for attention, love, and loyalty. That explains why strangers would stop us on Wuhan streets to commend my mother’s selflessness while scolding me for “turning my back” on my adoptive mother. Chinese people often assumed that by searching for my first family, I was hurting my American mom. In my later interviews with Chinese parents who adopted Chinese children, I found it common for adoptive parents in China to worry that if their child discovered the adoption he or she would no longer accept the adoptive parents. As one Chinese grandmother explained to me recently, “You are very strange. Over here, only kids who are not doing well will want to search for their birth parents. Your adoptive mom treats you well. You went to a good school. You are healthy and happy. Why do you need to search for your birth family?” It’s a typical view, reflected widely in the comments section of Chinese articles about my search and in the private messages and emails I’ve received. Yet, in the United States, adoption experts and professionals characterize birth search as a normal developmental step for an adopted person — a universal desire to know one’s origins. A birth mother embraces Jenna Cook; one of her daughters stands in the background. To date, I haven’t found my birth parents, so I don’t know what drove them to leave me on that Wuhan street in 1992. But I can attest that the 50 or so birth families I did meet felt deep and tangible pain. They threw their arms around me and wept. They bowed and begged to be forgiven. The encounters made me question to what extent birth parents “abandoned” their daughters in the traditional sense of the word. All of the families emphasized choosing a safe location where their daughter would be discovered quickly and taken to safety, and many parents left her with notes and special clothes in the hope that these tokens would help them find her later. One family wrote the daughter’s birth date on a piece of unrolled cigarette paper, saying, “It’s all we had.” Another family named their child after the parents’ two hometowns in the hope she would grow up knowing where to find them. Some mothers sewed clothes with distinctive patterns, like the one with blue and red checkers that the hopeful mom showed me. In meetings like these, we each—the birth parents of missing children and I—came to represent the other’s absent part. Parents would sob, “I’m so sorry. Do you forgive me?” and I would reply, “I forgive you. I forgive you,” as if on behalf of the birth daughter they might never again see. I also found myself projecting my feelings onto these families. I finally had the chance to say, “For 20 years, I’ve never forgotten you. Do you remember me?” I heard them reply, “Of course we remember you.” I asked, “If I had cried less, if I had been more beautiful, would you have kept me?” They said, “You were the most beautiful baby. How we have missed you.” The way we held and soothed each other—we did not share the same blood, but we understood two sides of the same pain. Nearly four years later, these encounters still haunt me. I keep in touch with some of the families via text message and the mobile app WeChat, but we usually simply wish each other “Happy Chinese New Year” when the time comes around. In the summer of 2015, I met up for lunch with a birth family I’d first met in 2012. They still had not found their lost daughter. After hugging me goodbye, the mom gripped my arm. “Promise me you’ll never give up,” she cried. “Promise me you’ll always keep looking for your family. Promise me you’ll do everything you can to find them.” I wanted to say that I was ready to put searching aside for a while. My story is on the Internet. If my birth parents and I are destined to meet again in this life, then we will. But in that moment, I couldn’t bring myself to say any of this. I glanced at the man standing next to her—the man who could have been my father—and I saw the same desperation in his eyes. They needed to hear that their own daughter would keep searching, just as they were. Standing in front of them, for that one moment, I spoke for her.